I was very pleased when I got the invitation to do a Late Junction session for the BBC. The nature of these sessions is that people who have never worked together before get together and create something in a day. My first idea was to invite inimitable Peter Liversidge to join me for the session, to do my delight he agreed and was very enthusiastic to take part! We set the date to record the session in June, and during that time I was on tour with David Allred, so it seemed a good idea to invite him to join us. 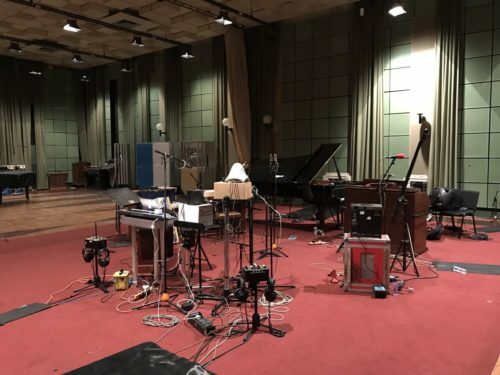 David agreed and the three of us spent the day in the beautiful Maida Vale Studios, singing along to some of Peter Liversidge’s sweet childlike voice memos and improvising all together. I’ve not heard the recording since the day we were in the studio, so I am naturally quite curious! If you’re curious as well, feel free to check it out here. The session airs for the first time tonight, August 24th, at 11pm GMT, and will be available in the archives after that. This entry was posted on Thursday, August 24th, 2017 at 11:23 am	and is filed under News. You can follow any responses to this entry through the RSS 2.0 feed. You can leave a response, or trackback from your own site.